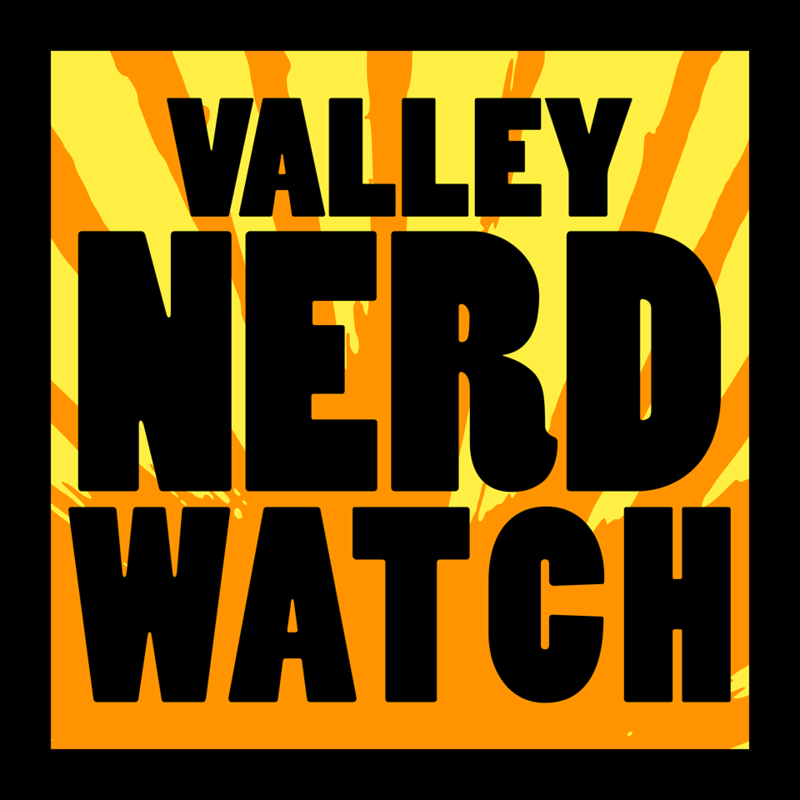 Welcome to the Valley Nerd Watch, upending all your expectations for narrative for another week! We’re excited to present to you yet another cool Kickstarter, for a locally-developed educational deck-building card game! It sounds really neat, and you can play it at Modern Myths this week if you want to get a feel for it before you actually contribute to the Kickstarter. But also it’s a card-game where the goal is to get enough fat layers to take a long nap and that’s worth supporting sight unseen in our opinion. Not nearly enough games officially end with naps. Also it’s coming up in a couple weeks still but everyone get excited for the next Nerd Nite! It’s going to be a special Third Anniversary Show with three presenters! Such excitement and wonder you would expect to cost an arm and a leg but no it’s only $5! Also we’re really excited to hear ourselves on The Chairmen of the Boards, a lovely local podcast! We talk about our work here and with Nerd Nite and it’s a good conversation we think you’ll like it. It should be up in a bit over a week! Create a simple multi-page booklet that’s easy to copy and distribute and is most importantly very very cool! Ages 11-16, register here because space is limited! Learn how to use 3D design software, use a 3D printer, use an engraver, and more things in order to create cool stuff! A neat trick is to 3D print a 3D printer so you can keep working at home. Nancy Schön is famous for excellent sculpture works inspired by children’s literature like the Make Way for Ducklings sculpture in the Boston Public Garden! Meet Nancy and learn about public art projects and her work on a skate park! Radical. Heroes! Clix! Put them together and what do you get? Clicky heroes, that’s right. This week try out a team of only people who can turn into animals. That’s Beast Boy, Snowbird, I guess we can count Animal Man too! Modified is about GMOs, which is an issue that bears a lot of reading about on account of how the way that US public policy feels about food determines what life is like for a lot of people around the world, and this is a great opportunity to learn from a journalist who did a lot of work finding out about GMOs! BUT ALSO this is just great copy so we’re just going to quote it “Modified is a rare breed of book that will at once make you weep at the majestic beauty of our Great Plains and force you to harvest deep seeds of doubt about the invisible monsters currently infiltrating our food and our land and threatening our future.” It will make your dog mow the lawn! It will make your house unfold into nth-dimensional space! It will active the X-Gene lying dormant within you! This book explores the lives of 36 inspiring women who struggle to overcome their mental health and relationship challenges. It was written as a tribute and gift to women everywhere. Helene DeMontreux Houston, MS, APRN, one of the co-authors, will discuss how the book came to be and how these stories were chosen. An exciting panel from the authors of Finding Wonders, Local Girl Swept Away, and Still a Work In Progress! They’ll read and talk about their works! One’s about groundbreaking female scientists, one’s about a mysterious death in Provincetown, and a younger sibling trying to maintain while his older sister is having a crisis. A party for a book about pets of course features giveaways and fun surprises, but also a chance to bring in donations of pet food, toys, bedding, etc for the Dakin Humane Society! You get a poster if you do, which is nice, but you also just made puppies and kittens more comfortable which is the best gift of all. Potluck + Kin-dza-dza! Soviet Anti-Utopian Comedy! Two hapless Russians accidentally teleport to the telepathic planet Pluke! Hijinks ensue, as they are wont to. Bring something to eat or drink! Join the meetup to see where to go, or just bring food and drink to some general location and lay it there as a respectful tribute to this meetup. Fiction and nonfiction celebrating the relationships between women and their dogs. Dogs are great. Author Michelle A. Gabow is a playwright honored to be be named the Roxbury Repertory Theatre’s playwright laureate in 2011! Local creator and Modern Myther Jesse Daniels is publishing a new card game called Hibernation, which is about being a bear! It’s kind of very cute. It’s a deck-building game where you try to make sure you’ve got enough food to develop layers of fat. First to five fat layers gets to take a long nap! It’s educational and also a game where the winner takes a nap which needs to happen more often. Support it on Kickstarter here. You can learn to play the game at this event with the creator! What’s Benford’s law? Does 1 appear more often than 7 in everyday life? Can math detect tax fraud? What do the statistics of numerals inform us about corporate sales? WELL? THE TEST IS NEXT WEEK AND YOU STILL DON’T KNOW? Better attend this SciTech cafe with Steven J. Miller, associate professor of Mathematics at Williams College. He researches number theory and he’ll help explain things to you. Keep track of the epic history of your family line in order to get straight exactly which sword glows with power when you wield it and what thrones of which nations are your right by birth! Theresa Chamberland and Jan Sadler will present on how to gather, choose, and organize the material we want to preserve! The election of 1912. Based on our very good American history understanding and entirely without using the internet we know it was between… Grover Cleveland and … another? WELP nope it’s the one that was between three people who all were or became President at some point we’re awful. Woodrow Wilson, William Taft, and Teddy “The Internet’s Favorite Tough Prez” Roosevelt! Learn more about this complicated three-way race! The 11th annual gala and art auction honoring artist Allen Say, angel Lee and Low books, bridge Steven Heller and mentor Regina Hayes. Awards presented by author Gregory Maguire! Get some real cool artwork and support the Carle! Put your drinking to work helping the library! That’s efficient use of your time. Music by Mark Ricker and Jimmy Burgoff! Tickets are $20 each and available at the library! Drop-in to craft a Star Wars thing before seeing the movie in Pulaski Park! Maybe craft a drop-ship to keep with the theme! There’s a bunch of fun stuff at this! A children’s farmer’s market where kids can have fun at the bounce house, getting their face painted, playing the distressingly-named “Cow Plop Bingo”, going to the bake sale, and just generally food and fun! Make things! Use a 3D printer, a CNC router, and lots of materials! Also, they’ll demonstrate balloon sculptures, the 3D printers of the circus world. Ages 8-12 welcome! Nerve tells of the global fight against the incineration of chemical weapons and other hazardous substances, due to the fact that it can be an unsafe disposal method. The film in particular highlights the Chemical Weapons Working Group’s important work to illustrate how grassroots activism can change everything! It was a pretty fun movie, right? See it in a park! See it in a park with other friendly people, it’ll be great! Come view Emily Dickinson’s landscape through the lens of an archaeologist during this presentation and walking tour at the Museum. Faculty and members of the University of Massachusetts Amherst archaeological field school will present the findings from their work on the grounds of the Emily Dickinson Museum in the spring of 2016. See the mask that Emily wore when she fought the Wayward Face! See the ray gun she stole back from Barsoom! It’s all exciting stuff.